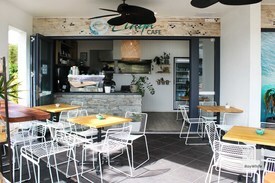 30 Commercial Real Estate & Properties in Coolum Beach are listed in 5 categories. We have 20 Industrial Warehouses Sale & Lease , 4 Development LandsSale & Lease , 4 Retail ShopsSale & Lease , 2 OfficesSale & Lease and 1 Hotels and LeisureSale & Lease . Emily Pendleton of Ray White Commercial Northern Corridor Group is pleased to present this fully fitted out restaurant for lease in the beautiful beachside location of Coolum Beach, located opposite the Coles shopping complex, this restaurant is an an excellent location with huge signage opportunities and good outdoor dining. 40m2 internal + 42m2 external dining Located opposite Coles shopping complex, and footsteps to the beach Boasts good signage opportunities Situated amongst other well established food tenants which creates good food traffic Ample on street car parking Available Now Contact our exclusive marketing agent Emily Pendleton to arrange your inspection or to discuss further. Exceptional opportunity to locate your business on David Low Way amongst other national businesses including Domino's Pizza, McDonald's, Coffee Club, Westpac, NAB, Bank of Queensland, Rip Curl, multiple real estate offices and more. The property is ideally located in the major retail strip in Coolum opposite the Coolum Beach Holiday Park. With the expansion of the Sunshine Coast Airport providing the growing levels of international tourism as well as the increasing development of housing in the area, Coolum is expected to see a rapid growth in its population and economy. + Building area of 72sq (approx) + Large windows and ample signage space + Ample passing foot and vehicular traffic, essentially through the peak tourist seasons + Suspended plaster ceiling with ducted air conditioning + Floor tiles throughout + Rear parking and ample street parking Call or email Matt Marenko or Louisa Blennerhassett to inspect the property or find out about other suitable options. Our team is strategically located in two offices across the Sunshine Coast region and is ready to handle your commercial, industrial and retail property needs today so call or email now. Brand New Industrial Units From $27,648pa + outgoing..
Emily Pendleton of Ray White Commercial Northern Corridor Group is pleased to present Lot 3, 1740 1744 David Low Way, Coolum Beach as a tenanted investment for sale by Private Treaty. The property is situated within a high profile, beautifully presented resort on Coolum Beach front called Clubb Coolum Beach which boasts very good online reviews with 5 stars. The resort is home to 65 self catering apartments over 11 storeys of luxury accomodation and the restaurant for sale (Lot 3) is tenanted to Bombay Bliss who have occupied the restaurant since early 2015 and also have 5 start review online. The resort is located immediately opposite the very popular and safe lifesaver patrolled beach, and just a few steps to the best dining and shopping in Coolum on the Sunshine Coast. Tenant: Bombay Bliss Operational: 4 years in this location Lease Commencement: 1 Jan 2015 Lease Expiry: 31 December 2020 Option: 1 x 3 years Current Net Rent: $81,091.58 Outgoings: 100% paid by the tenant This property is being sold by the way of Private Treaty for $1,160,000. For further information or to arrange an inspection please contact Exclusive Marketing Agent Emily Pendleton on 0402 435 446. The subject unit provides the very rare opportunity to secure a premises with the perfect balance of office and warehouse space. Sitting at the front of the development, with road exposure and ample car parking, the unit provides for both warehouse and office space with a high quality level of fit out in place. Road frontage and great exposure Ample on site parking High quality office fit out High clearance warehouse space Back to base security system CCTV For more information or to arrange an inspection please contact Jordan Hayes on 0417 999 331 or Michael Shadforth on 0488 981 076. Neat and tidy office warehouse of 460sq m (approx) located in the Coolum Beach industrial hub close to the Bruce Highway, Sunshine Coast Motorway and the Sunshine Coast Airport. + 460sq m (approx) high clearance warehouse + Includes office with storage mezzanine + Container height roller door + Two further rear roller doors access the concrete hardstand + Also available for sale at $765,000 + GST (if applicable) Call or email Matt Marenko to inspect the property or find out about other suitable options. Our team is strategically located in two offices across the Sunshine Coast region and is ready to handle your commercial, industrial and retail property needs today so call or email now. Move Straight In - Functional Factory Warehouse Must Be Sold $765,000 + GST (if applic.. The owner has given us clear instructions that the property must be sold. 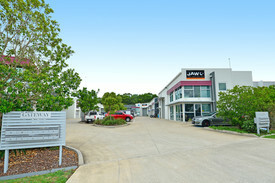 Office warehouse of 460sq m (approx) ideally located in the Coolum Beach industrial hub close to the Bruce Highway, Sunshine Coast Motorway and the Sunshine Coast Airport. + 460sq m (approx) high clearance warehouse + Includes two levels off office plus storage mezzanine + Container height roller door + Two further rear roller doors access the concrete hardstand + On site parking + Only three in the development + Also available for lease Call or email Matt Marenko to inspect the property or find out about other suitable options. Our team is strategically located in two offices across the Sunshine Coast region and is ready to handle your commercial, industrial and retail property needs today so call or email now. Six Industrial Units From $221,000 + GST (if a..
Freestanding Building, Prominent Position $232,800pa + outgoings + ..
+ 243sq m freestanding building on 610sq m site (sizes approx) + Prominent position and exposure + Dividable area, lessor will assist with new shopfronts and doors + On site car parking spaces + Flexible lease terms available Call or email Paul Forrest or Paul Butler to inspect the property or find out about other suitable options. Our team is strategically located in two offices across the Sunshine Coast region and is ready to handle your commercial, industrial and retail property needs today so call or email now. 40m2 internal area Located in busy Woolworths complex Currently fitted out as a hair/beauty salon Situated amongst strong tenancy anchored by Woolworths an including Flight Centre, Vet, Bottle Shop, Butcher, Bakery and Medical Centre Ample onsite car parking with 238 car parks dedicated to the complex Suitable to a variety of tenants Contact Ray White Commercial North Coast Centrals leasing team to take advantage of this opportunity today! Impressive Corner Development From $39,528pa + outgoing.. Impressive Corner Development From $527,040 + GST (if a.. Seven Unit Development From $250,000 + GST (if a..
Industrial Units With 50sqm Mezzanines From $120 p/sqm PA + outg..
Industrial Units With 50sqm Mezzanines From $488,196 + GST (if a..
High Quality Industrial Units - Off The Plan From $120 p/sqm PA + outg..
High Quality Industrial Units - Off The Plan From $266,166 + GST (if a..
Land area 8,482m2 Sunshine Motorway frontage Fully fenced Short or long term leases available Lease price from $7/m2 Contact our exclusive marketing agent for further information.